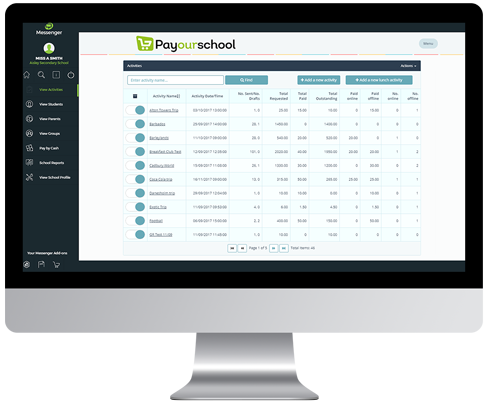 View Groups will display a list of existing classes and groups as per your MIS data. The second column on this page will help you to differentiate between classes and groups (including Messenger Saved Groups). 1) Open Messenger Payments from your Tiles (Homepage), if you aren’t already in the Messenger Payments interface. 2) To access View Groups, select the option from the Menu at the top of the page. 1) Enter the class or group name you need to view into the search bar at the top of the page, then click Find from the right corner. 2) The middle column (Is class?) will be set to Yes if you are viewing a class, and No if you are viewing a group (e.g. a Registration Group). 3)The final column (Student count) will display the number of students currently assigned to that class/group. 4) To remove a previously entered search filter, just click Reset Search. 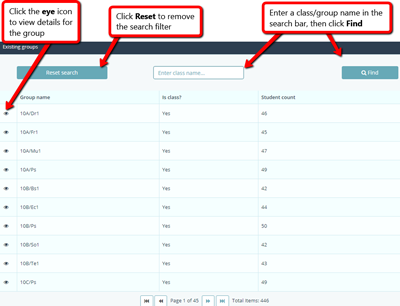 1) Once you have located a class, click on the icon in the first column to view more details for a specific class. 2) Viewing a class or group will display a list of all the students linked to it in your MIS, or Saved Groups in Messenger.